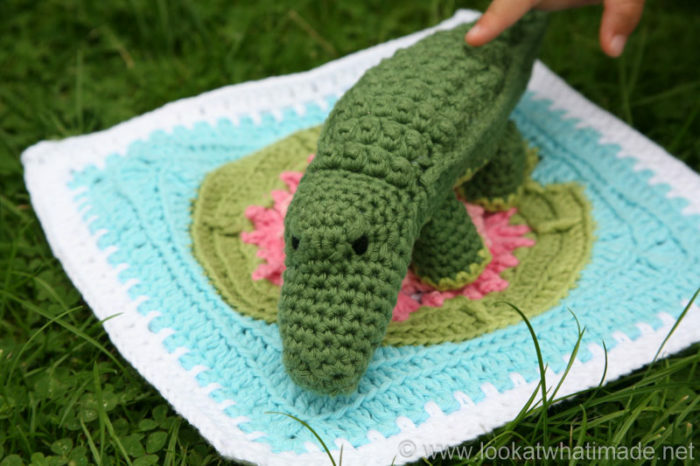 I am super excited to present Colin the Crochet Crocodile. He is the fifth Little Zoo Animal (and my third collaboration with the talented and very funny Anette Bak). You will find the photo tutorial for Colin below. I have also created a printer-friendly PDF (which contains only the most necessary photos) for those of you who don’t need a photo tutorial. You will find the link for that under ‘Resources’. If you want to find out more about the creation of this little crocodile, you can read more HERE. ©Anette Bak and Dedri Uys 2014. All Rights Reserved. () – When used inside instructions, you should repeat everything inside parentheses the amount of times specified. 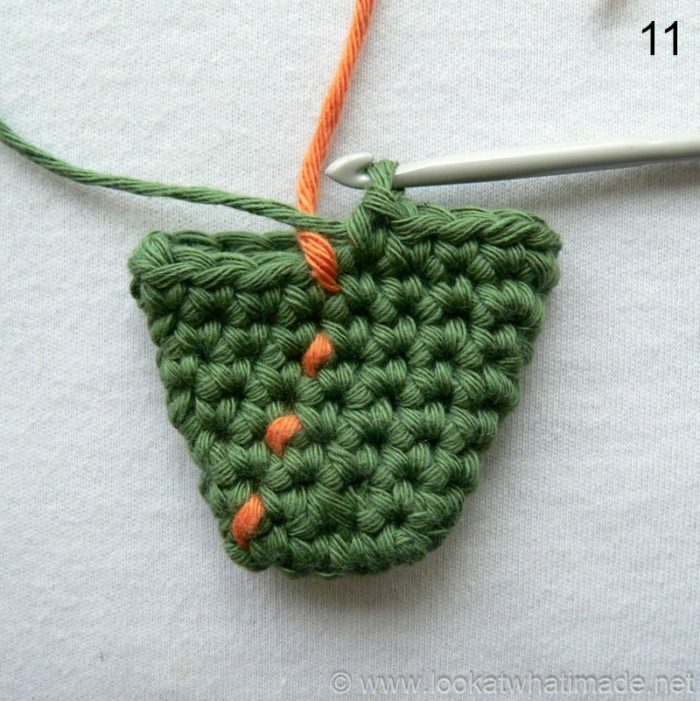 When used after instructions, the number between parentheses refers to the stitch count. 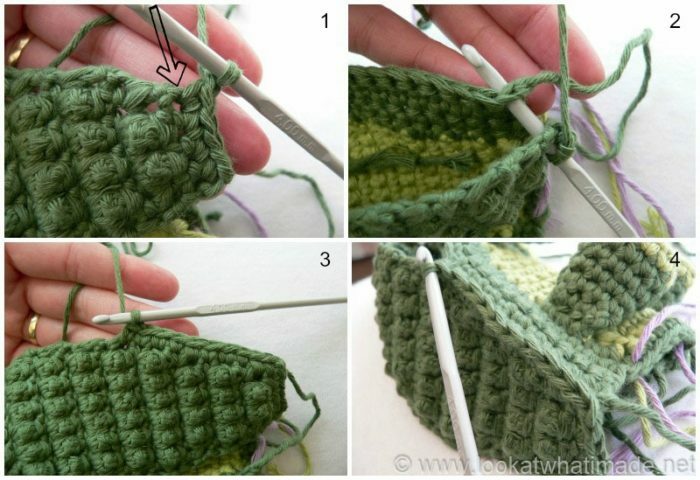 Popcorn st – Make 4 sc’s in the same stitch. 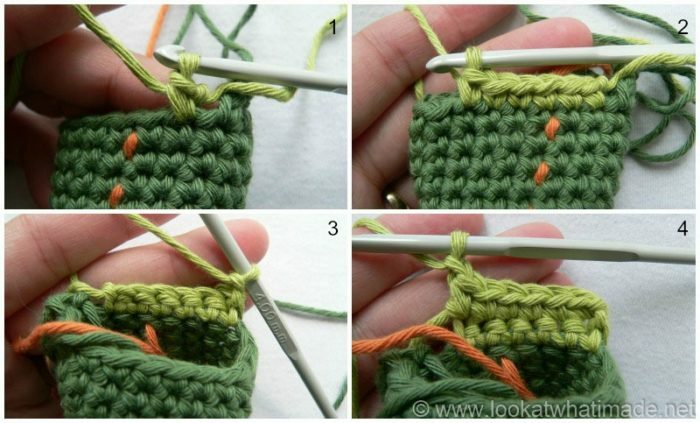 Pull up a loop with the last stitch and remove your hook. Insert your hook into the first sc of the popcorn and pull the last loop through the first stitch. Ch 1 to close the popcorn. See this tuturial. 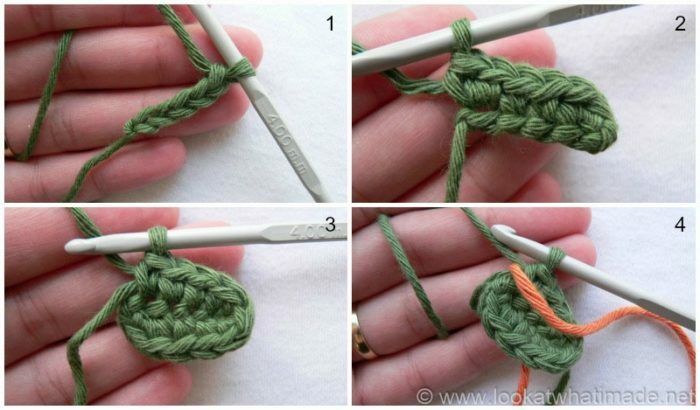 RSM (Running stitch marker) – Place a piece of scrap yarn over your work before making the first stitch of a round. 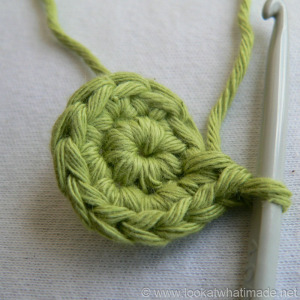 Flick this piece of yarn backwards/forwards over your work where indicated with RSM. This forms a running stitch up your work that will help you identify the beginning of each round. Sl st in the next st, ch 1 and bind off. Pull the last ch st tight to form a little knot. Place the foot on top of the larger opening of the leg (the last round of the leg) like a lid, with the right side of the foot facing you. 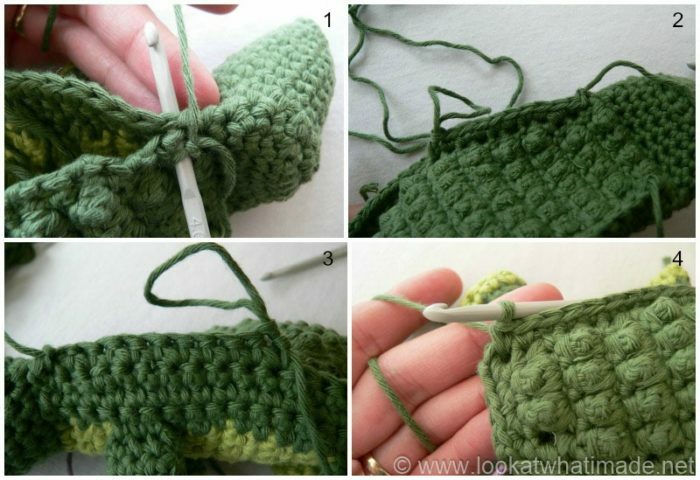 Insert your hook into the blo of the next st of the foot and through both loops of any stitch around the leg and make a sc. Make 11 more sc’s, working into the blo of the foot and both loops of the leg. Join to the first st with a sl st (or use the invisible join) and bind off. Repeat until each leg has a foot. Pull all the tails of yarn into the leg, if you haven’t already done so, and stuff the leg (about ¾ full). The head uses short rows. These are just rows that do not begin and end where rows traditionally begin and end. I have indicated with (outside) or (inside) whether a specific short row should be worked with the outside of the head facing you or the inside. Note: The 2 sc inc’s should fall on the sides of the jaw when folded flat (Photo 11). Short Row (inside): Skip the sl st. Sc inc in the first sc. Sc in the next 4 sc’s and sc inc in the last sc before the “step”. See that loopy bit of yarn in Photo 20? Each step will have a loop like that at the base of the step. Sl st in the next available st of Short Row 10 and turn. (8) Photo 21 shows you Short row completted after turning. Photo 22 shows you what your head should look like at this point when folded flat. Photos 27 – 29 show you what your head should look like at this point. This is a good time to stuff the head and add the eyes (if you are using safety eyes). 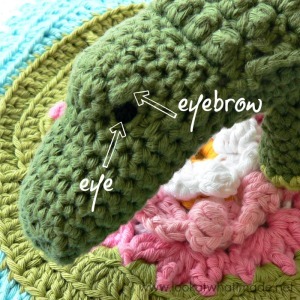 If you are going to embroider the eyes, you can do that once you’ve finished the crocodile. The body is made with a Contrasting Colour underbelly worked in rows from the head. You will then add the legs to the underbelly and work Main Colour sides followed by a Main Colour back. To attach the sides and back, you will be working into the rows of the underbelly. If you have trouble identifying the ends of the rows, place a stitch marker in the first st of each row of the underbelly. This is tedious but helpful if you cannot yet identify row ends. You are now going to make a MC border all around the underbelly, while attaching the legs at the same time. There are 20 rows of underbelly and you will be working into each of these rows. Pick up the dropped loop from the head. Hold the crocodile so that his mouth is pointing towards your right (left if you are left-handed) and the outside of the underbelly is facing you (Photo 1). 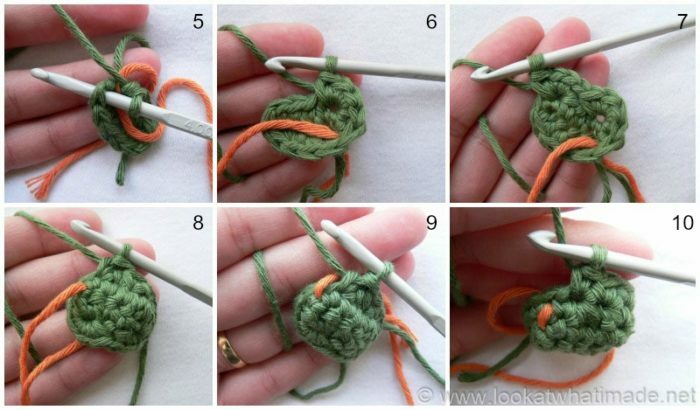 Place a piece of scrap yarn over your work. Sc in the side of the first 3 rows of the underbelly (Photos 2 and 3). Fold one of the legs flat and place it on top of the underbelly so that the foot is pointing toward you and the first round of the leg is lined up with the side of the underbelly (Photo 4). Insert your hook through both layers of the first st of the folded leg AND into the next row of the underbelly (Photo 5) and make a sc (Photo 6). Make 2 more sc’s through all 3 layers, working into the next 2 st’s of the leg and the next 2 rows of the underbelly (Photo 7). Sc in the next 8 rows of the underbelly (Photo 8). Attach the second leg as before, again making 3 sc’s through both layers (Photos 9 and 10). Sc in the next 2 rows of the underbelly (Photo 11). (Sc, ch 1, sc) in the last st of Row 20 of the underbelly (indicated with an arrow in Photo 11 and illustrated in Photo 12). Place a st marker in the ch-1 space. Sc in the next 4 st’s of Row 20 of the underbelly (Photo 13). (Sc, ch 1, sc) in the first st of Row 20 of the underbelly (indicated with an arrow in Photo 13 and illustrated in Photo 14). Place a st marker in the ch-1 space. You will now continue down the other side of the underbelly. Sc in the next 2 rows (Photo 16). Attach the third leg as before (with 3 sc’s through both the leg AND the underbelly). Sc in the next 8 rows (Photo 17). Attach the last leg with 3 sc’s. Sc in the last 3 rows of the underbelly. This will bring you back to the head. Do not bind off (Photo 18). Just look at that. More roadkill than crocodile…but not for long! You will now add 3 rows to one side of the underbelly. Skip the 2 sl st’s. Sc in each of the 20 st’s across. Ch 1 and bind off. Pull the ch st tight to form a knot. (20) There are now 8 st’s of the head left unworked. You will now add 3 rows to the other side of the underbelly. Start with a sl knot already on your hook. 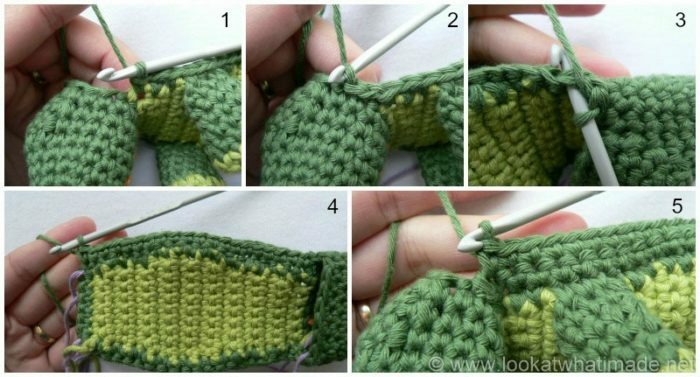 With the outside of the crocodile facing you, insert your hook into the second to last available stitch of the head and make a sl st (indicated with an arrow in Photo 1 and illustrated in Photo 2). If you used a stitch marker before starting the MC round around the underbelly, this will be the second st before the st marker. If you haven’t used a st marker, count the unused st’s of the head and make a sl st in the seventh one. You will now work the back in rows using MC. You will not be attaching the back to the sides at this point. 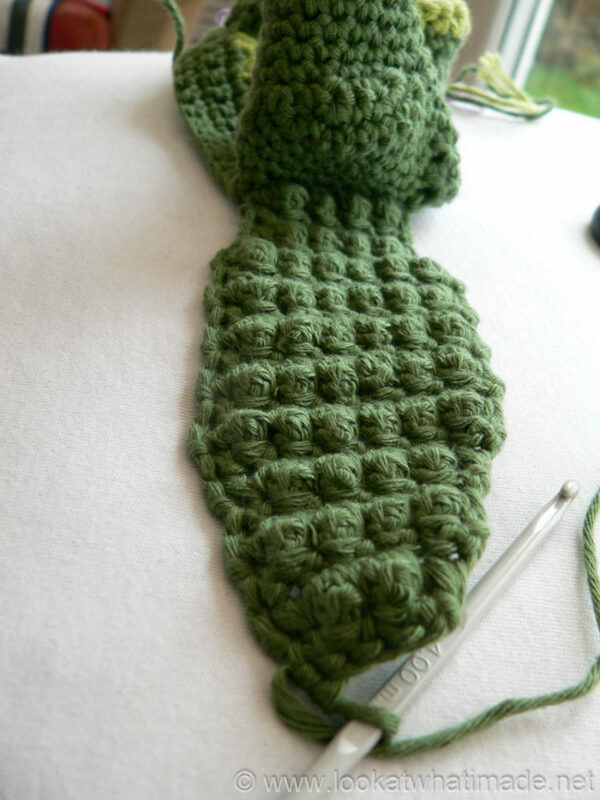 When you are done with this part, your crocodile should look like a peeled green banana (with legs…and a head…and no banana…you get the picture). It can be very tricky to get into the ch st’s that form the top of the popcorns. If you crochet tightly, like me, and can’t get into them for love or money, work into the gaps between popcorn stitches instead, remembering not to accidentally skip a stitch if you do so. Hold your crocodile with the head pointing towards you. 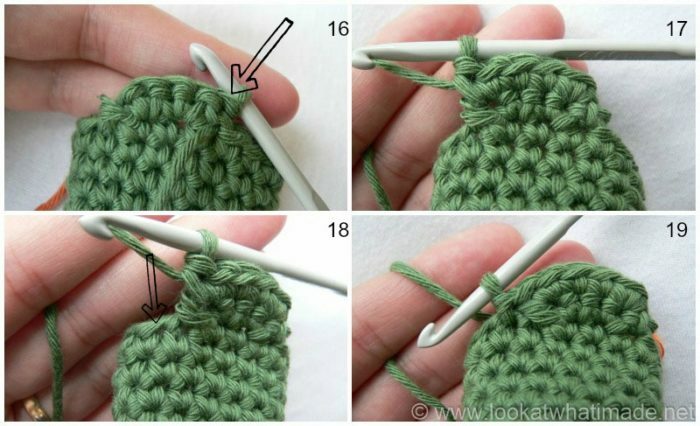 Join your MC yarn by making a standing single crochet in the st of the head that already contains the last sl st join from the first side (green arrow to the right in Photo 1 below). Make a popcorn in each of the next 4 st’s (black arrows in Photo 1 below). Sc in the stitch that contains the sl st join from the other side (green arrow to the left in Photo 1 below). Ch 1 and turn. (6) Photo 2 shows you what Row 1 should look like completed (before turning). Sandwich the top (back) and the side closest to your hook together. The crocodile’s back should be facing you. Insert your hook into the last st of Row 20 of the back (so the first hole down the side of the back – indicated with an arrow in Photo 1) and into the last st of the last row of the side (Photo 2). Make a sc through both layers. Insert your hook into the next row of the back and into the next st of the side and make a sc through both layers. You have now made 2 sc’s. Continue making 17 more sc’s through both layers, working into each row of the back and each stitch of the side (Photos 3 and 4). Sl st through both layers of the last st and bind off. Sandwich the back and the other side of the crocodile together. The head should be pointing to your right (left if you are left-handed). The back should be facing you. 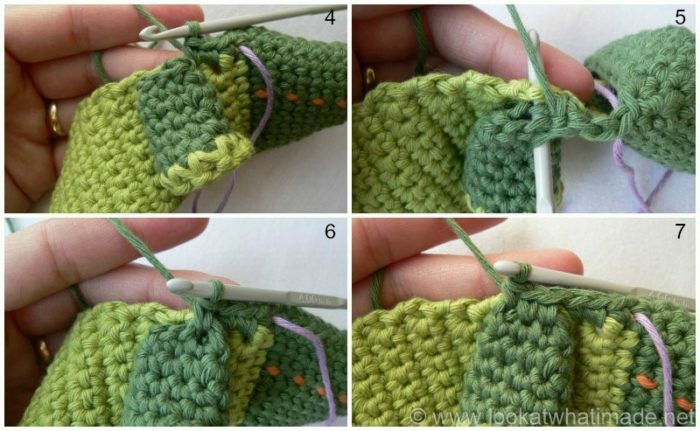 You are going to start at the end closest to the head this time so, with a sl knot already on your hook, insert your hook into the first row of the back and into the first stitch of the last row of the side (Photo 1). Make a sl st through both layers. 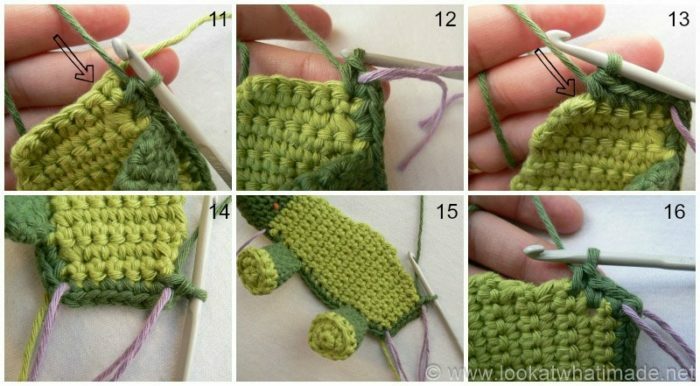 Insert your hook into the next row of the back and into the next stitch of the side and make a sc through both layers. Continue making 18 more sc’s through both layers, working into each row of the back and each st of the side (Photos 2 – 4). Do not bind off. You will now make the tail. Photo 3 shows you that the sc’s should make a flat edge on the side of the body, while making a ridge on the top of the body. The tail is worked in a spiral around the hole at the back of the crocodile’s body. Stuff the body before starting the tail. Stuff the tail as you go! Note: If you find it hard to see if you have skipped a stitch before the 4 sc’s, count 4 st’s back from the stitch marker to identify the next st to work into. The last sc of the 4 sc’s should fall in the stitch before the stitch marker. Sc in the next st. Make a fpdc around both of the fpdc’s from Round 13. Skip 3 st’s and sc in the second to last st of the round. Again, if you find it hard to see the stitches you need to skip, count 2 st’s back from the RSM and make your sc in that stitch. Sl st in the last st and bind off. 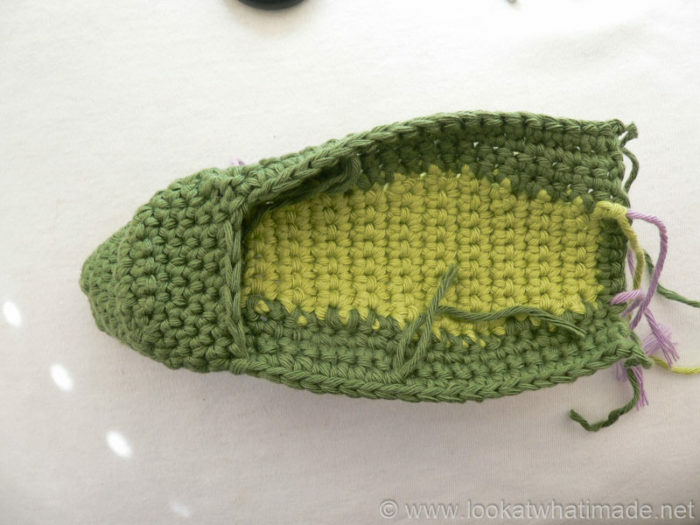 Use the tail of yarn to sew the last 4 st’s shut. Embroider eyes with black thread. I suggest placing the eyes more or less where the rounding of the short rows starts (or in the stitches indicated in Short Row 11). When embroidering them on, go from one eye to the other through the head and pull on the yarn so that the eyes pull the head into a narrow peak. Add the eyebrows just above the eyes by working across 2 rows, 4 or 5 times. Use MC yarn for this. 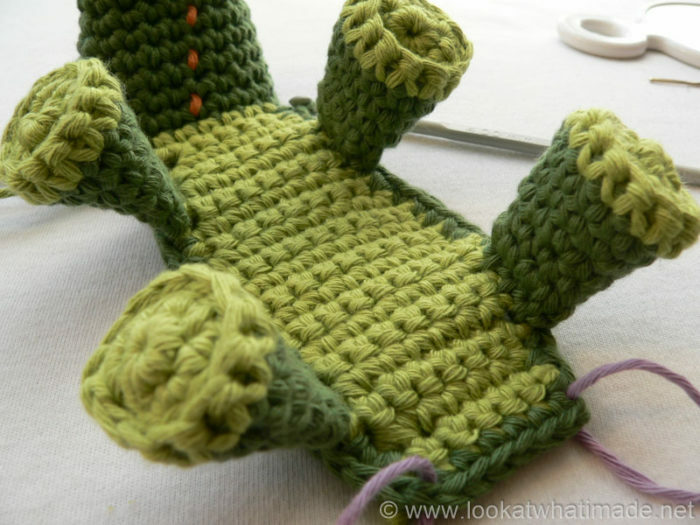 If you want to flatten the crocodile’s mouth/nose a little bit, use MC yarn and sew from the bottom of the mouth to the top of the mouth/nose in a few places, placing tension on the yarn so that it pulls the mouth/nose flat. If you want a flatter body, do the same thing, making sure to catch only one strand of the stitches on the underbelly; otherwise, you will have ugly MC stitches showing. You can find the rest of my free patterns and tutorials HERE. Alice, thank you SO much for pointing that out to me. If you find anything else, please holler. I always appreciate it when people take the time to highlight errors. Have a great day! Wanting to make a little bigger. Any tips? 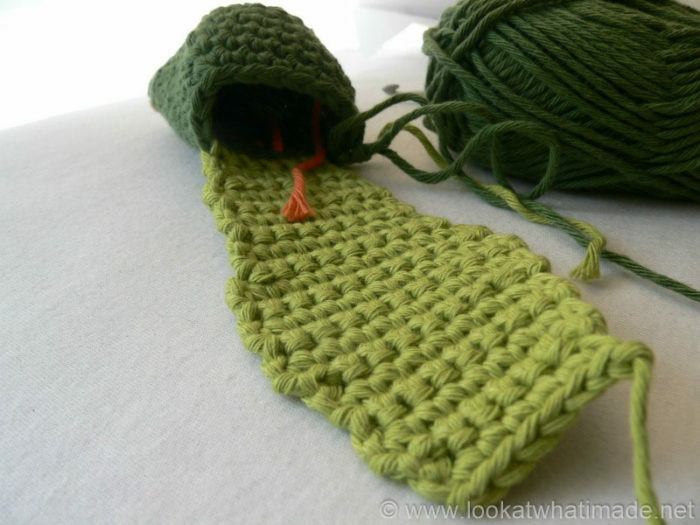 Krystle, you can try using bulky yarn and a 6 mm hook?